Bulldog Movers has been the Atlanta area’s most trusted full service mover since 1982. Our movers are some of the most highly trained in the industry and provide a comprehensive array of residential and commercial moving services for local, state to state, and international customers. Packing: Our movers are highly trained in the careful and secure packing of a wide range of both residential and commercial items. Whether you need to have a valuable chandelier placed safely in a custom-built crate or an entire office computer system disconnected, properly labeled and packaged, our movers have the expertise to get your belongings packed the right way. 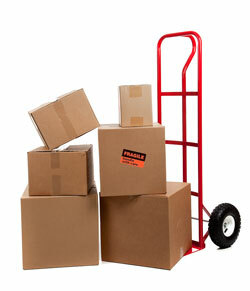 If you prefer to self-pack, we have all the supplies you need, and we never charge for unused boxes. Moving: Whether you need to move locally, state to state, or internationally, Bulldog is the full service mover with the resources to ensure your items arrive safely and on time. We boast one of Atlanta’s largest moving fleets with more than 100 full-time movers, manning approximately 30 of our signature red trucks. Our standard trucks are larger than the competition’s, which means fewer trips. We are licensed by both the state and federal departments of transportation to move items out of the U.S., and have all the necessary knowledge of customs requirements and other shipping regulations to avoid delays. Storage: If you also need storage for your belongings, we offer clean, dry, highly secure space in our 40,000-square-foot warehouse facility. With such a vast array of services with unbeatable benefits, Bulldog is the full service mover you can depend on. We have the distinction of being the only full service moving company in Atlanta to earn the Consumers’ Choice Award for nine years in a row. To learn more about why we are the full service mover residents of Atlanta trusts for their household and commercial moves, contact us today.